← Crick reloaded: citizenship education and British values. We are roughly at the mid point of our commemoration of the First World War. Let’s look back just over a hundred years. London before the outbreak of war in 1914 was the greatest industrial city in the world and by far the largest in Europe, a city of migration where new arrivals were welcomed in large numbers but were also subject to racism and xenophobia, a city of inequality and widening class divisions with great poverty; over a million living below the poverty line while their near neighbours included some of the richest people in the world. It was a city of exploitation; sweated and insecure labour, working and living in appalling conditions and overpriced slum housing. It was a city of widespread industrial unrest; with walkouts on building sites, lockouts and strikes on the trams and in the factories, with local councils refusing to administer grossly inadequate poor relief. It was also the focus of a militant struggle for women’s suffrage with assaults and demonstrations as well as the vandalism of art galleries used as tactics. London was in ferment before there was even a whiff of war in Europe. Then, on 24th July, Austria declared war on Serbia. By the 27th, war preparations across Europe had shut down the world financial system and on the 31st the London Stock Exchange closed down indefinitely. Across the city, thousands attended anti-war rallies, but by the time Germany declared war on France and then invaded Belgium on 4th August, jingoistic war-fever took hold and the crowds were supporting British intervention. Jaurès predicted that if the various alliances were triggered; Austria with Germany, Serbia with Russia and Russia with France, it could mean: “Europe on fire, the world on fire.” On 31st July, Jaurès was assassinated in Paris becoming one of the first ‘casualties’ of the conflict. The very escalation he had predicted had started and war was inevitable. Soon, in London, crowds were gathering in silence to watch the endless stream of ambulances bringing thousands of casualties from the front into the city’s hospitals. Terrifying new military technologies were in use and London was being bombed from the air by Zeppelins. Dangerous anti-German hysteria was rife and Alexandra Palace was transformed into a squalid internment camp for London’s citizens of German origin. 100 years ago today, the battle of the Somme was still raging. A single campaign, it cost 1 million lives. One million – it’s hard to take in killing on such a terrible scale. The war went global with a final toll of 17 million dead and 20 million wounded, destroying or traumatising a whole generation. Even the peace, when it finally came, sowed the seeds of deep resentments and further conflict which was to engulf the world in 1939. This is not ancient history about remote conflicts of purely academic interest. These events affected people many of us have known, they have shaped our lives and were themselves shaped by forces which are still with us. History doesn’t repeat itself precisely but we know that gross inequality, injustice, xenophobia, nationalism, militarism, poverty, exploitation, war and refugee movements are still features of our world. Our governments debate whether to accept refugees from the brutal conflict in Syria and this is often framed in the language of mistrust, suspicion and thinly veiled racism. A hundred years ago, as our city’s francophone population increased tenfold during the war years, those same prejudices were being expressed about refugees, including those from Belgium and France. 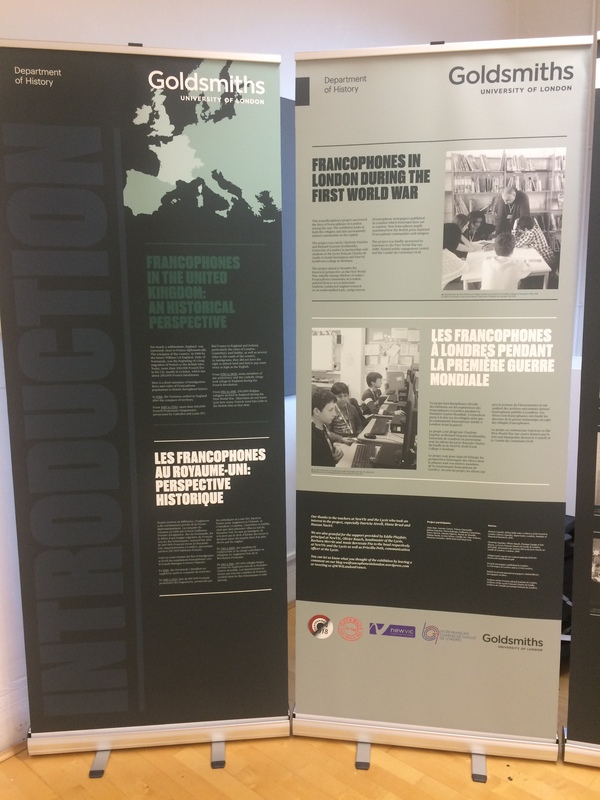 We must congratulate and thank Dr. Charlotte Faucher and Professor Richard Grayson at Goldsmiths and the students they worked with from both the Lycée Français Charles de Gaulle and Newham Sixth Form College for this excellent project. This research involved students using primary archival sources to uncover the lives of the French and Belgian refugees who made their home in London at this time. This type of research is vital to help us understand more about our grandparents and great-grandparents and to draw parallels with our own period. The resulting exhibition will be on display here at Goldsmiths for a while, then at the Lycée in South Kensington and on to NewVIc in Plaistow in the New Year. 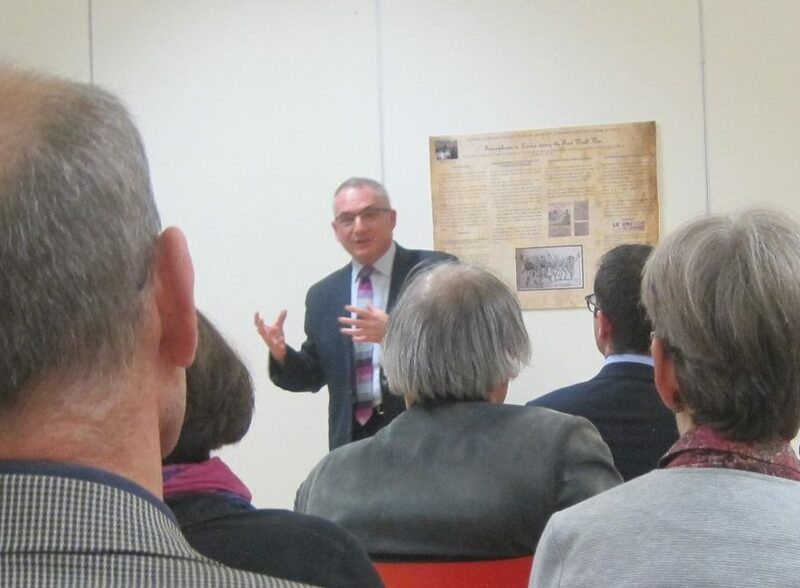 Speech made at the launch of the ‘Francophones in London during the First World War’ exhibition at Goldsmiths on Thursday 22nd September 2016. This entry was posted in History, Learning resources, NewVIc and tagged Anti-war, France, Goldsmiths University of London, Jean Jaurès, London, refugee, Romain Rolland, world war 1, xenophobia. Bookmark the permalink.